how can i get this addon? Thank you for a info. Just here. I made this buses to pak64.HU-PL . Merged Ikarus file will include these buses. I made Ikarus293 in player changeable color, Budapest(BKV)(blue) color, and Polish colours. And below the full Icarus fleet. Icarus Buses have be gives in east Germany too. But with the dead of the old (DDR) be goes the use too. Yes I now. Ikarus factory was working to 2008 in Hungary, and after has broken. But the factory be reborn in 2010 with this models V187, V134, E127. But this new buses just there iun hungary, and Russia yet. Oh than it my database over buses out Hungary not really up to date. I want to make to Pak64.HU-PL few IFA truck. I don't remember: IFA was East German truck? I sended the merged Ikarus.pak to your email adress. Please remark if the pak arrive. Thanks. And I have a question to you. I saw the blue danube map there is in your projects. Can you show me on a screenshot how to looks this map? Thanks for the HÉV -- it looks great! My only comment would be that the green is perhaps a little too bright, and going by the pictures of HÉV trains it should be a little duller and more turquoise-like. The Blue Danube map is at an early stage -- I'm just putting the finishing touches to my New England scenario. Here's a shot of the heightmap in Gimp. I plan to add cities and road infrastructure -- probably in pak128.german to begin with, but perhaps also in pak64.hu-pl when that gets off the ground! Hi Vladki! Thanks for your comments. As I said, it's still a work-in-progress, so more rivers will likely be added. Similarly for erroneous surface water, which will be removed. However, I've found whilst making this and other maps that there is typically more surface water than you think! There are little lakes, ponds and streams etc to be found almost everywhere. Of course there is a lot of small lake, ponds, streames etc. The scale should be the rule - are they large enough to occupy at least one tile in this scale? Are they important for a simulation - model trains? Some of them could be replaced by appropriate groundobj or factory (fish pond). The map you see has been generated from a Digital Elevation Model, i.e. satellite heightmap data. The only thing I've added is emphasis to the rivers. So in theory, all the water you see should be large enough to occupy the space of one tile. However in practice, the DEMs can add extra water in low-lying areas where there is in fact no water. Suleyman, I like your buses. Your EMU is beautiful too; but it needs some realignment, because its sections overlap each other in almost each direction. Yes. IFA was a East German Truck Factory! But i have no Pictures from IFA Trucks. I will look after Picture from IFA Trucks then i have a good working internet. Thanks, I waiting for the pictures. I be glad of the buses are good. The HÉV(EMU) is not a finished project, just prototype yet, if it will be done I will upload, to here. Now I finished RÁBA trucks (cat1, cat2, cat3, cat6), Im working on the CSUV tram. I need some help from somebody! I want to create a RÁBA trailer and Camion, but I can't make dat file, the camion not good to trailers. Could somebody send me a sample dat file for a Camion, and trailer? Thanks for your help, that is what I look for. This include, that I want to know. Here is the repaired version. I sended the repaired merged ikarus pak to your e-mail, and here is the repaired HÉV, this work in pak 64 standard. And a new vehicle CSUV tram from Budapest. Doesn't CSUV means "Csuklós Új Villamos"? Your vehicles are fine. Yes Csuklós Új Villamos is correct! Next time I will send you Hungarian ways, electrifications, and rail and tramways. You don't have to send me all your addons, just upload them here. I'll download it. Hi everybody! I made some new vehicles and others to pak64HU-PL. 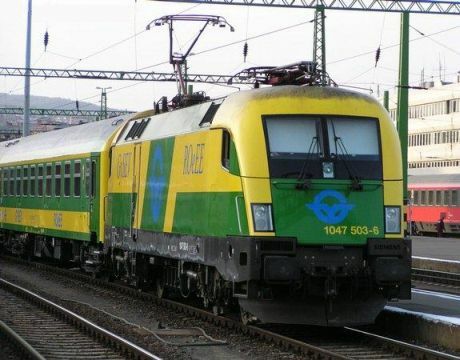 First the MÁV locos and cars. Those are really impressive! Good job! I have only one constructive criticism -- the white on the MAV passenger carriage and the yellow on the GYSEV carriage (and perhaps the red on the M61) could probably do with being toned down a bit. One good way to do this would be to find a photo of such a carriage and use GIMP's eye-dropper tool to find approximately the right colour. I've found that to be useful.